No matter the size of your business, whether you run a large multi-million dollar corporation or a small family business, your security matters. Security protects your assets and can truly affect the fate of your business, which can also dictate much of your life. Though there are many costs that must be spent on your business, the investment that you make in your security will pay for itself over and over again. As an additional benefit, you and your employees will have peace of mind knowing that they and the business that they care about is safe. All of our commercial locksmiths are vetted and have the knowledge and skills to install any system you need: for that is what being a licensed locksmith means. We expect nothing less of our locksmiths than to be customer-focused and provide the highest-quality service. Our commercial locksmiths are available 24-hours a day, 7 days a week and promise a 15 minute response time to enquiries because when we say we are there for you, we truly mean it. 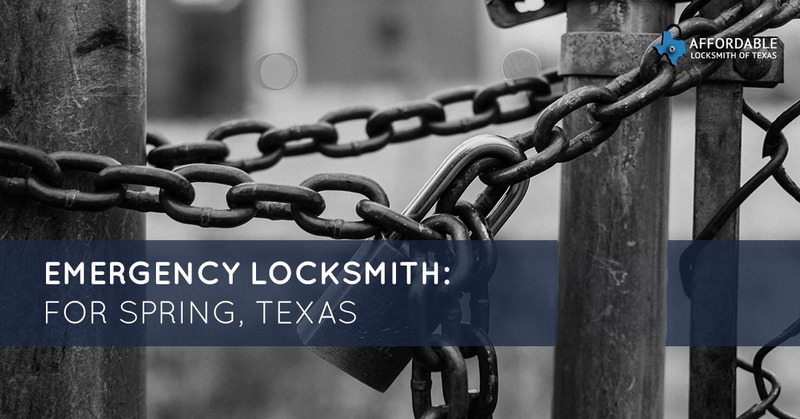 If you are interested in upping your security for your business, are locked out, or simply need to fix a lock, we are there for you with our 24-hour locksmith services. Whenever we receive a call, we arrive exactly when say we will, with the proper tools and equipment to perform the service you need. We truly care about our clients in Spring and so provide nothing less than the best. If you are interested in working with us, but don’t see the service you need listed, contact us. First-time clients get 10 percent off their first service! Contact us today for all your commercial locksmith needs in Spring!